Euphorbia canariensis f. cristata hort. Accepted Scientific Name: Euphorbia canariensis L.
Sp. Pl. 1: 450. 1753 [1 May 1753] L.
Origin and Habitat: The odd crested forms are rare and may appear both on seedling batches in a very small percentage and in habitat too. 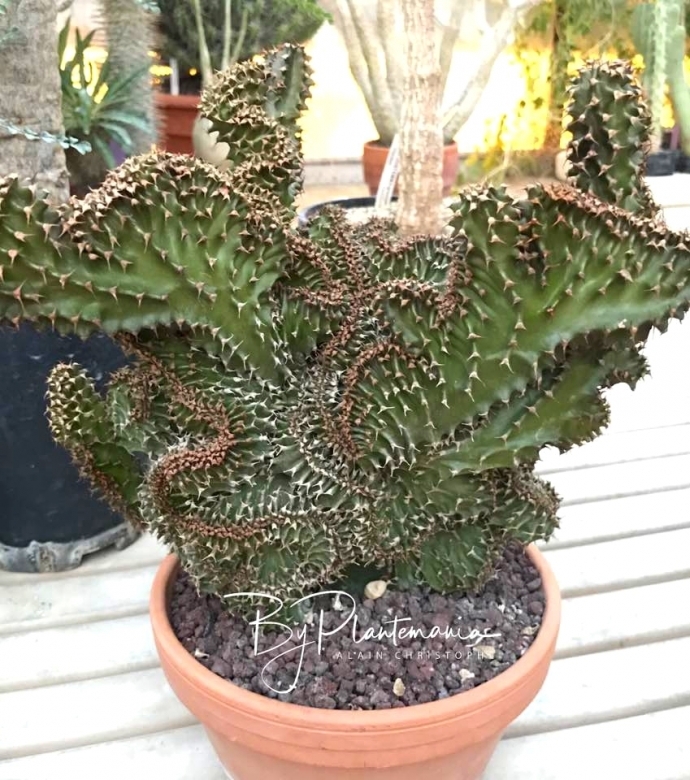 Euphorbia canariensis var. spiralis Bolle ex Boiss. in DC. Description: The typical Euphorbia canariensis is a small succulent shrub, 1 to 3(-4) m high. It clumps profusely from the base, one trunk may produce more than 150 branches as thick as a man's arm. Crested form: There are several crested forms cultivated for their beautiful stem with short pairs of spines and pronounced sculpture effects. These plants produce monstrous crests, and crests occasionally produce normal shoots. Euphorbia canariensis L.: has cactus-like columnar, upright growing, stems that clumps profusely from the base. Euphorbia canariensis f. cristata hort. : Crested form. Euphorbia canariensis f. viridis G.Kunkel: Has pure green stems, but in all other respects it indistinguishable from the standard species.